In case your list of “Things not to do 10 hours before a helicopter whisks you away for a week-long hut trip” has an open slot, feel free to add: take a 12-foot swan dive into a parking lot. Seems obvious, but since I recently accomplished it, I highly recommend putting it on the list. 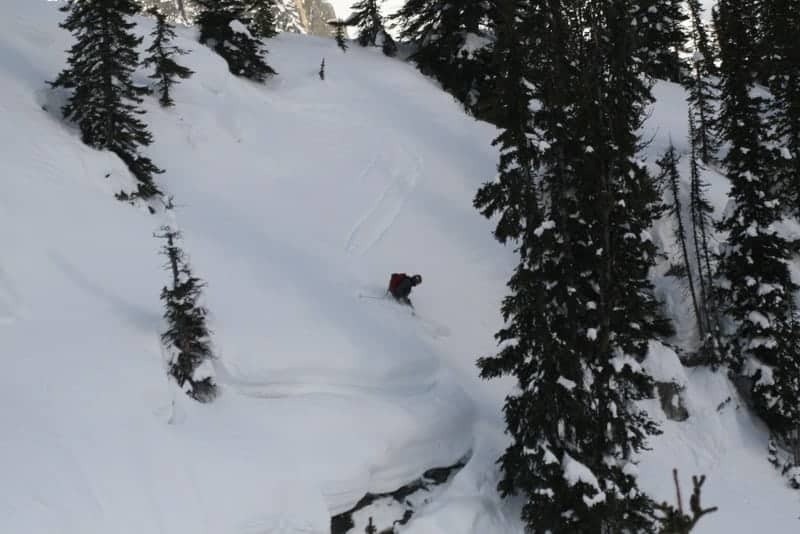 Golden, British Columbia, was absolutely getting hammered with snow. The roads were a mess, passes were closed, and a mile-long section of Highway 95 consisted of idling semis just waiting to rush off into the storm. Things were looking good for an amazing trip. Our group of 15 had successfully navigated a $1,600 food and unknown dollars amount of beer purchase in Spokane, Washington, in preparation for the hut. Amidst the excited chaos of having made it to Golden, we realized the 250 pounds of meat and cases upon cases of beer lashed to the roof of a suburban would freeze if left outside. Instead of making the smart choice of an orderly unpacking, we went the guy route. We parked the suburban near the second-floor balcony where our rooms were, my brother Mike scrambled on top of the car and started slinging deli meat. A hastily constructed fire brigade line was assembled and the car was quickly unloaded . . . until we got to the beer. Now to his credit, Mike did mention that the 30-pack of Coors Light seemed heavy. But I shrugged it off, “Do it.” His first attempt came up short, but he caught it. So I leaned over the balcony readying for his second attempt, which was better, but still a little short. I grabbed it as its trajectory was swinging back down and whoosh! The thing ripped me over the railing. I didn’t land on my head; that was good. But I managed to land in the only non-snowy patch of the parking lot leading with my shoulder. The collarbone snapped and I knew it immediately. You may be asking yourself, “Why in the world would you voluntarily admit to this?” Good question. Essentially because the cover-up is worse than the act. I’ve got a lot of brothers and sisters. My parents have spent a lot of time at the ER. And this seemed like one of those times where they didn’t need to know the whole story, so I told them after the hut trip that I had slipped. I still haven’t answered the question. My brothers and I are all in our 30s. We’ve been concocting and getting our stories straight for years, so that we’d respond accordingly under interrogation from the parents. But our track record isn’t so impressive. The story nearly always leaks. Plus my parents are tight with a number of my friends who knew the whole story. Mocking suggestions of how they were going to tell my mom didn’t bode well. So now you know why not to dive into parking lots. Sorry about the half-truths mom and dad. 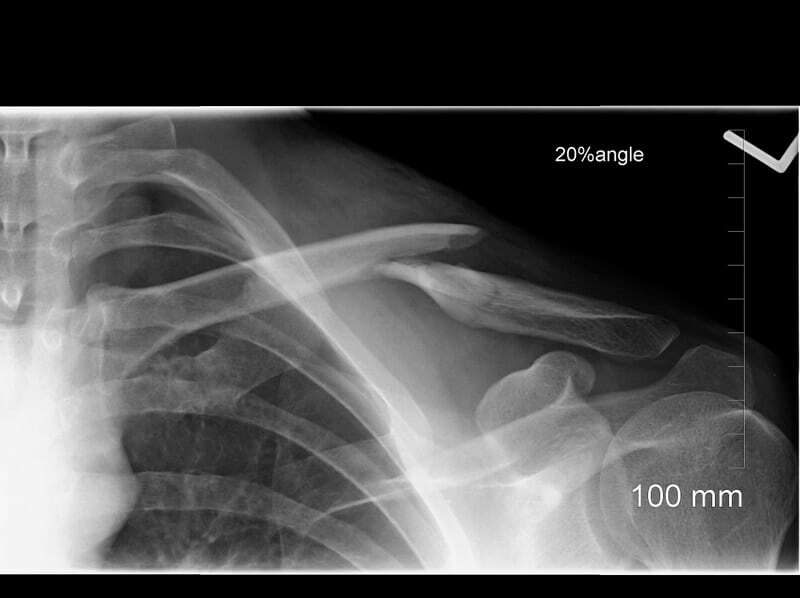 On a positive note, you can still tour and ski with a broken collarbone. It just hurts like hell.